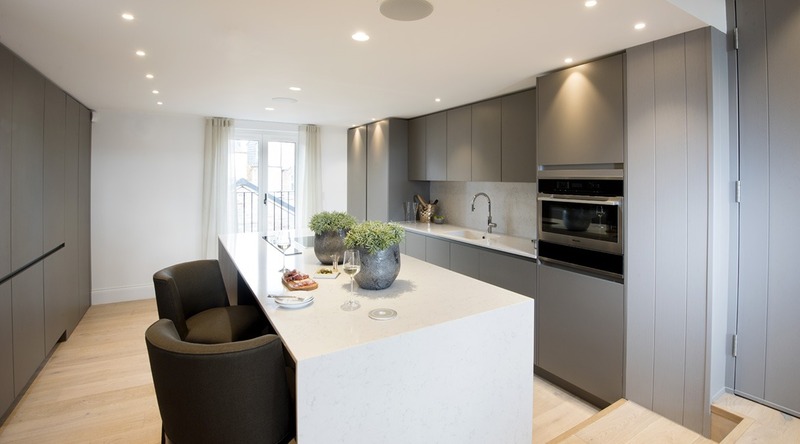 Our design team delight in bringing their creative skills to a diverse range of properties. 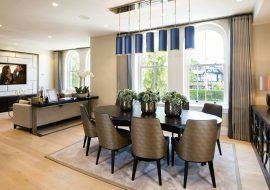 A recent project saw a complete turnkey interior design solution for a first-floor apartment which is housed within an attractive Victorian building. Originally built in 1861, the property’s recent history has seen it used as commercial premises and only latterly has it been redeveloped into a premier complex of seven apartments. 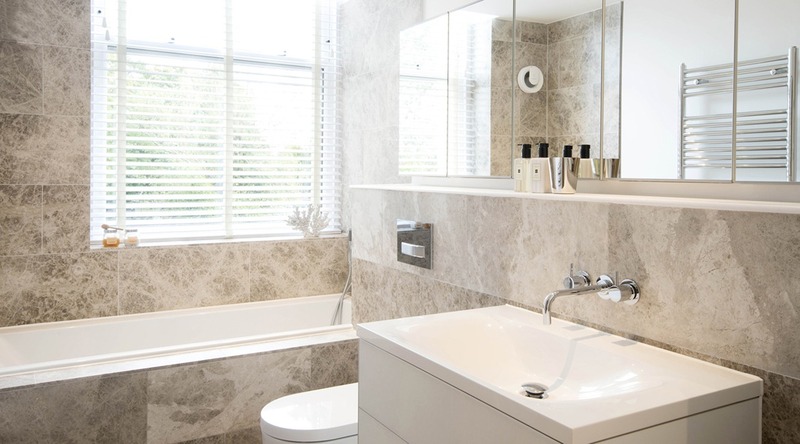 We were commissioned to transform the newly constructed shell of the three bedroom space into a fully designed, specified and furnished home which was ready to move in to. To create a contemporary space which is also sympathetic to the property’s heritage whilst designing as an easily identifiable masculine space with a luxurious but not ostentatious feel. 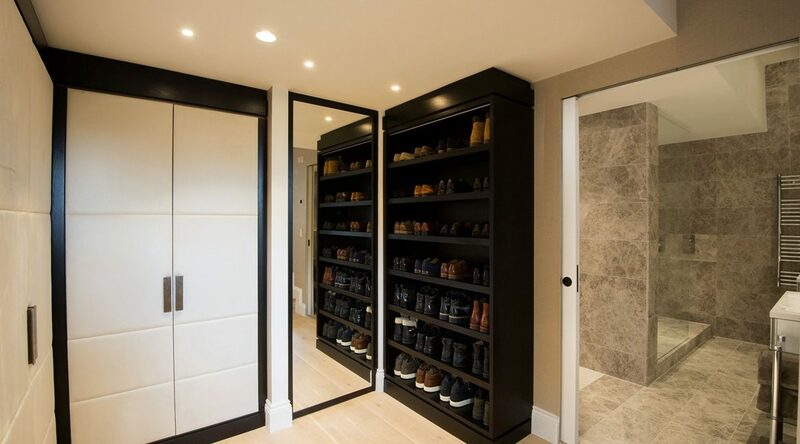 A specific requirement was to house the client’s extensive collection of clothes and shoes. 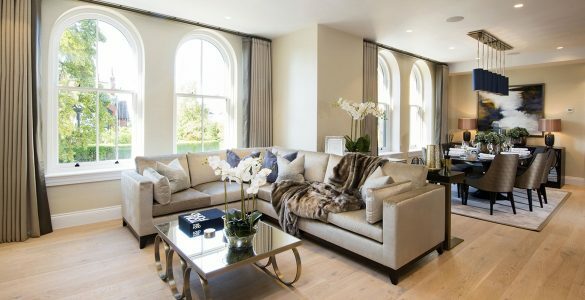 The main living space is open plan and, with light flooding in from four arched period windows, it allowed us to design the space in rich, luxurious tones without closing it in. Bespoke cabinetry is used throughout the apartment and in the living space, one wall benefits from a chocolate stained oak media cabinet with geometric faux suede paneling and a bronze trim, designed to complement the centrally positioned coffee table. 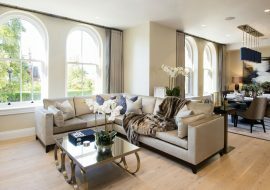 An L-shaped sofa in cream velvet speaks of understated sophistication without compromising on comfort, whilst the period windows are framed in curtains created from muted tones of ecru with the leading edge in a darker, contrasting colour. A console table in a high gloss finish artfully delineates the living and dining spaces. There is a subtle change in tone in the dining area which offers a more overtly vivacious atmosphere. 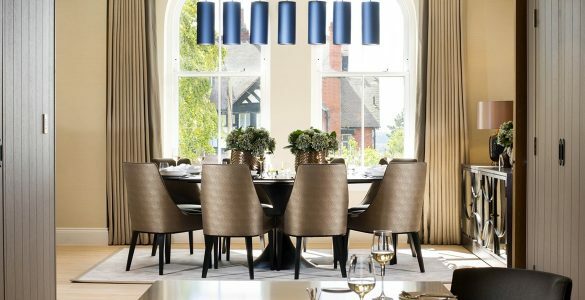 An ebonised oak and dark bronze oval table form the focal point whilst drop pendant lights adorned with blue silk shades, together with gold lining, create a warm ambiance which lends itself to entertaining. 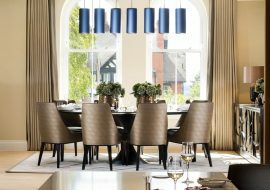 The dining chairs are designed to combine style and practicality, with a dark bronze textured fabric to the backs and a plain bronze stain repellent material adorning the seats. A sideboard in stained timber with mirror panels to the door and an intricate timber pattern detail graces one wall whilst above it sits a piece of bespoke feature artwork. With accents of blue, this artwork was chosen for continuity with the light shades and to offer cohesion to the scheme. We dressed this space with accessories in rich bronze tones to add warmth and character to the room. The vases which adorn the dining table are crafted from bronze ceramic and finished with a glaze and they are artfully styled with artificial hydrangeas. Other key pieces in this space are the matching lamps set atop the sideboard which feature a hand-blown glass base with bubble effect and a shade in warm tones of bronze. To one side the living room steps down to the cinema room which is designed as a much darker and more atmospheric space than the rest of the apartment. Our intention was to create an enclave which offers the epitome of refined relaxation. The crittal style doors welcome guests and offer a glimpse of the living room beyond, ensuring that space does not feel disconnected from the main living areas. Designed in deep tones of purple, every last detail in this room ensures a fabulous guest experience – from the window treatments which are extra wide to ensure a full blackout, to the deluxe soft velvet of the sofa, to the luxuriously upholstered ottoman complete with inset tray detail. 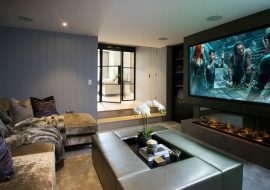 The 85-inch television screen is mounted onto the face of a spectacular three-sided floating chimney. The fire springs to life at the touch of a button and bathes the space in a warm glow. We layered a variety of inviting textures in this room to create a fully immersive experience for the guest. Working with older buildings invariably throws up challenges which require our designers to adopt a pragmatic approach to design. The master bedroom of this apartment houses the inner workings of the home, namely the boiler and water pipes. 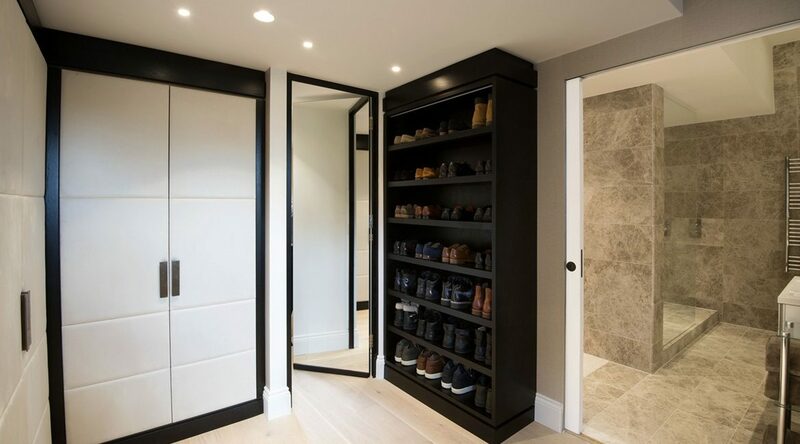 We designed bespoke soundproof cabinetry with faux suede paneling and a bronze trim to conceal them from sight whilst allowing for access when required. 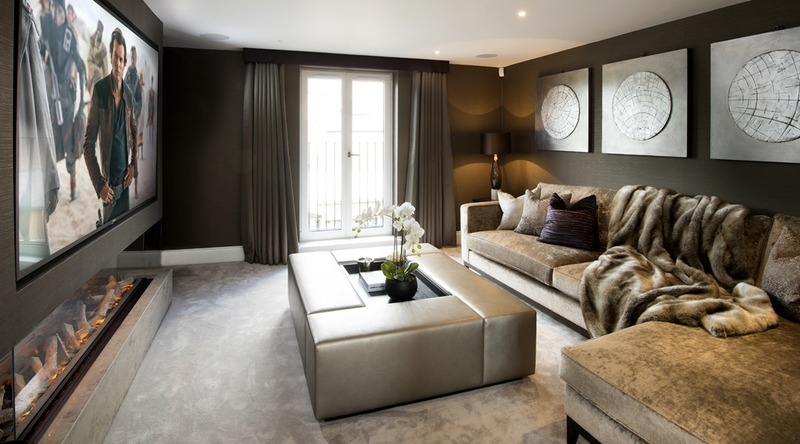 We opted for neutral tones in this room to create a calm and sophisticated feel. 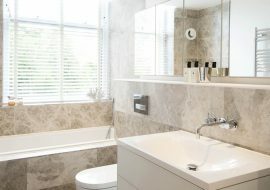 This is further enhanced with the use of dark stained wood throughout which forms a charming contrast to the cream tones which underpin the design. Dramatic interest is added with the introduction of accents of rich purple. The bed features a bespoke headboard crafted from velvet for a truly opulent feel. At either end this is flanked by bronze mirror panels to add warmth, depth and a feeling of space to the room. The sleeping area is framed by a faux silk rug in warm tones of cream with a leather border for a contemporary feel. 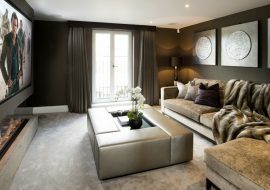 We completed the scheme with accessories in warm tones of amber and an upholstered ottoman in a bronze textured fabric. The elegant scheme used in the master bedroom flows effortlessly down into the dressing room which is positioned on a slightly lower level to add interest and create definition to the space. The bespoke cabinetry features doors in faux suede with hammered bronze handles. The statement piece in the room is a shoe display with inset LED lighting to each shelf. The adjacent wall is designed with a mirrored panel which hides a secret door – a discreet fire exit from the study beyond. 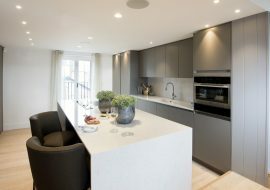 The apartment at Greenwalk was a joy to work on. Limited flexibility on space planning meant that our teams’ capacity for lateral thinking and problem solving was brought to the fore. 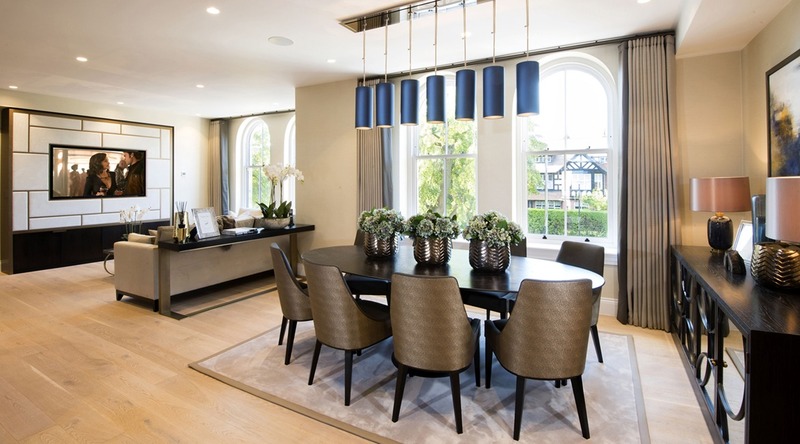 Ultimately it is incredibly satisfying to be able to deliver a full design and product specification solution which transformed a construction site into an exquisitely styled boutique apartment.